The world is evolving as customers do not need to converse with the employees when they are going to banks nor when ordering food. They would rather do the same task with an unmanned system, or a kiosk machine. Yet this convenience is apprehensible mainly for the younger generations, while the elderly are unfamiliar with rapidly developing electronic devices and unable to use unmanned system services. Before, when customers entered fast food restaurants, the employees welcomed them. However, nowadays, a kiosk machine, which is an unattended self-service booth with a touchscreen, provides information or makes sales instead. Senior citizens feel flustered by this change. 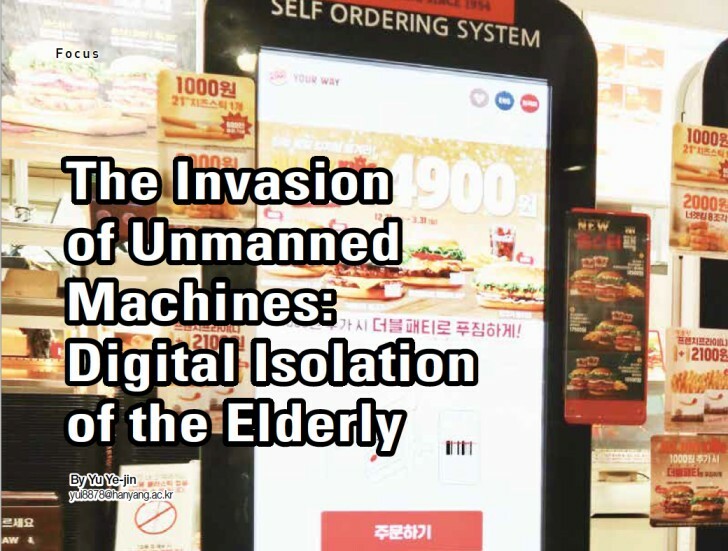 They suffer inconvenience while ordering hamburgers through an unmanned system at the fast food store. In order to prevent digital alienation of the elderly from changes being brought to the quality of life, society must help them not to lag behind in this technological progress.